What area of risk do you want the software to manage: Quality Assurance, Health, Safety, Environment, Financial, or all of the above? Do you need a system that works at an enterprise level or that is simply developed for small single site businesses? How many staff and contractors work for your company? Do you need to have mobile access? Do you want the system to integrate with any of your other software programs? What features of the software are particularly important to you? Once you’ve answered those questions, you can begin your search. First, you’ll need to decide what type of risk management software you want: Web-based, also known as software as a service (SaaS); or a hosted, on-site solution. Web-based risk management software is extremely popular for businesses of all sizes that are looking to keep costs low while still gaining the efficiencies that come along with the adoption of risk management software. Web-based risk management software has two main advantages over its on-premises counterparts: lower costs and mobile access. The potential for cost savings with a Web-based solution results from the elimination of an extensive range of hardware and software components needed for a system hosted in-house. These can include servers, terminals or access points, licenses, implementation, and ongoing maintenance through IT support and software upgrades. Depending on the size of the system, the investment required for this type of on-site setup can be extremely costly leading into the thousands of dollars. In contrast, the costs associated with a SaaS platform are based on a recurring fee of $15 to $100 per user, per month (though some services require annual payment in advance). This fee includes IT support, updates and a platform that is accessible on mobile devices. Additionally, the software won’t become outdated because the services include regular updates. There are risk management software solutions that have a fixed price tag, and are not priced per user. You will need to do your research on the two different payment models. The price may be lower depending on the attributes of the system and your organisation. Enterprise risk management software solutions could start from approximately $15000 for configuring and setting up the system, and then approximately $1000minimum per month for subscription costs. The one drawback to a Web-based solution is that, by some estimates, the total cost of ownership for subscription-based SaaS risk management software tends to be somewhat higher over the long term. But more and more business owners are willing to pay that extra cost to get another key benefit: mobile accessibility. Over 98% of organisations choose Web-based risk management software for this very reason. The ability to connect stakeholders throughout the world and communicate the company’s key performance information in real time is one of the key benefits of Web-based software. The risk of theft related to on-site risk management software is not nearly as high as a service that houses data on third-party servers. It stands to reason that you’ll get a higher level of security when you’re using your own servers that are monitored in-house. Hosting your own servers greatly limits the number of people who have system-wide access to the servers and your data, thereby limiting your risks. Are you more comfortable having a third party control your risk management data, or do you need to maintain control in-house? For example, what happens to your data if the company goes out of business or unexpectedly merges with another company? Customisation of your risk management software is often a key concern for many businesses, especially when specialised products are involved. It can be important when the risk management software is to be integrated with proprietary systems. While many Web-based platforms offer aspects of “customisation,” this often simply means that you can tailor the platform within a set of predetermined parameters. In contrast, customised enterprise risk management software is designed to be almost completely configurable. This may include additional screens, data objects and workflows. A customised application programming interface (API) is frequently necessary for the integration of large data sets and is often critical to collaboration and risk management. One drawback of a customised system is that it can often take longer to design and implement. Prepare for a minimum of two months to deploy a risk management software solution that is tailored to your specifications of your business. OSH Software (Occupational Safety & Health software). Employee and Human Resource Management – Managing all information relating to your employees is extremely important to integrate with management of your QHSE data. All QHSE data such as incidents, assets etc. should be linkable back to your employees. Contractor Management – Some companies have a small amount of contractors, and some have hundreds or even thousands of contractors. Regardless of your contractor workforce, you still need to ensure your contractors have provided verification of their competencies, with information about their licenses, training, documents etc. The system should also be able to track contractor compliance and allow contractors to enter all required SWMS or risk assessments, inspections and checks as per your company’s requirements. Incident Management – Prompt reporting incidents is incredibly important for the organisation to prevent exacerbation or recurrence of the incident. Workers need a simple yet effective way to report incidents that is in line with the company’s incident reporting method. Once the initial report has been submitted by a worker, the workflows of the system should then escalate to a varied level of investigation depending on the extent or type of incident that has taken place. Injury Management and Return to Work – Injury Management and Return to Work are complex and demanding areas for employers. An Injury Management system is designed to make the return to work process clear and easy to deploy, and is designed to make it easy to support your staff when they return to the workplace. The Injury Management system should include Return to Work Plans and Notes, Integration with the software’s HR, Incident Reporting and Return to Work modules to manage every step of the process. If the system is configured and highly automated, then the Injury Management process should be effective in closing out injury management cases promptly. Hazard Analysis – Employees and other stakeholders must be offered a way to report hazards before they cause an incident. This system should link to the company’s risk assessment process, but be simple enough for workers to understand and quickly complete. The details can be dealt with by upper management in the company. Risk Assessment & Analysis – Incorporating data that includes threats, opportunities, risk probability, sensitivity analyses, risk correlations and a wealth of other components related to risk probability, the risk analysis feature ensures a far more accurate analysis for the company. Each company has a different way of assessing risk for their business. Whether you use a simple or complex risk assessment method, it is important that the system can effectively link risks to your task or actions management system, incident management, and other parts of the system. Audits & Inspections – We all know of iAuditor, Nimonik and other auditing software on the market. Although these systems are good as a standalone system, it is important to either integrate these systems with your QHSE risk management software or ensure that the system can allow you to create your own audit and inspection templates. The system should also allow you to schedule audits and inspections to any stakeholder within the business. Some risk management systems have very similar attributes as the standalone systems so do your research and you may be able to consolidate your costs and merge the systems into one. Learning Management Systems (LMS) – Without over complicating your systems, an enterprise risk management software system might also have the ability to deploy eLearning and other training programs to your staff, contractors and other stakeholders to the company. The system needs to be fully functional on PCs, tablets, and smartphones. It also needs to be able to maintain training records online and offline which links to employee records. SCORM or interactive PowerPoint presentations is also a great advantage when getting serious about how you train your workers. SCORM picks up answers clicked by the trainee and is recorded to their final score at the end of the session. The system should be able to play online or offline video content at any time. If the software you’re evaluating can only record training that has been completed from other offline or 3rd party source, then the system will be deficient in relation to what is available in today’s marketplace. Task Management – Corrective and preventative actions, and other task related actions that may be required by the business should be driven by the risk management software. Linking task management across the system allows the company to continually improve in a structured and consistent fashion. Actions may also be integrated across your asset management system for scheduled maintenance etc. Simplifying data entry through a selection of templates, advanced task management also elevates flexibility in reporting. This feature is known to take advantage of automated workflows, automatically assigning tasks and alerting stakeholders via email. Permit to Work Systems – Permit to work systems for areas of risk such as confined space, work at heights, electrical work etc. are essentially just checks and balances prior to seeking authorisation from your company. It requires complex yet fully automated workflows to ensure persons seeking a Permit to Work authorisation has completed the necessary risk management steps to ensure the high-risk work is completely safely and is approved by your company to be conducted. Visitor Management – Your new system should be able to automate access permissions and provide self-service inductions, log who has visited your sites, when they have visited your sites, and what areas they have accessed. The system could also deploy QHSE and facilities management induction courses and documentation for site visitors, and automatically adjust access authorisation accordingly. Other attributes of a good enterprise risk management software system offer the ability to synchronise with Staff ID and Card machines, including those with security coding, and providing all necessary data for performance, compliance and OHS audits. Document Management – An enterprise risk management system should have the ability to upload your QHSE risk management systems documentation at the very least. If the system has the functionality to automate document naming conventions, have document review and approval workflows, and a rich text editor, then you will be onto a great system. File sharing is a key component of collaboration, file sharing establishes a central location for all project documents, sending out notifications whenever a modification occurs. Whether hosted on local servers or in the cloud, file sharing should provide security as well as an easy interface that keeps everything organised. Email integration – Another important element for collaboration, email integration prevents stakeholders from having to navigate between two different platforms when working on site. This feature typically includes email tracking and history, automatic email reminders and a variety of templates for quick communication. Many platforms also have the ability to integrate email addresses with all known social media profiles associated with that email, further connecting all means of communication. Business Intelligence and Automated Report Building – We recommend that your new system be able to extract key bits of information from the system and populate it into pre-configured graphs, tables, charts, and reports. Some systems have the ability to even compile your scheduled corporate reports. This reduces the amount of time spent by employees to extract and compile the reports in preparation for review by the company’s management team or members of the board. Beakon – Beakon is an industry leading enterprise level QHSE Risk Management Software provider. This system seriously does it all. Everything mentioned in the article is done by Beakon. Beakon is a mid-range priced product in its field. Where some systems cost hundreds of thousands of dollars, Beakon is more competitive in its pricing model against systems such as CMO, Intelex, EHS Management 360. It also includes a full LMS which many more expensive systems do not. Each part of the system is configured to your requirements. You are then trained to configure additional elements of the system. This allows your system to grow with your company. 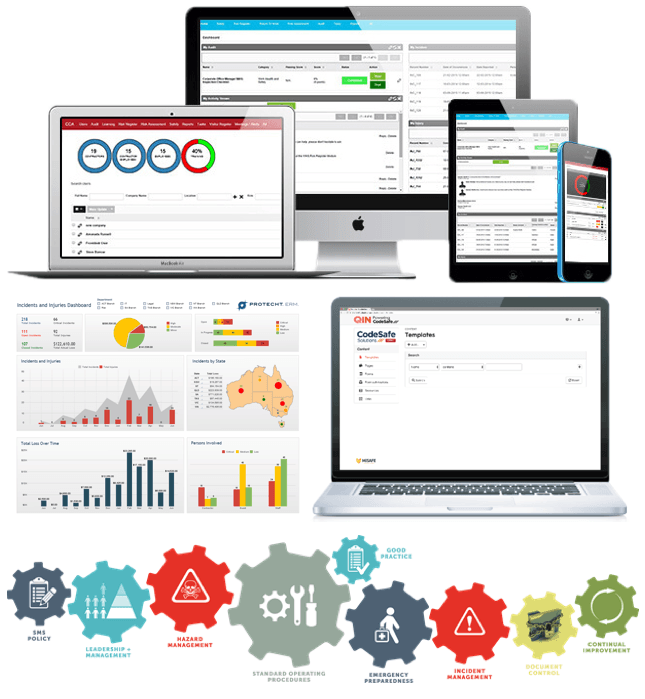 Beakon is a great risk management software solution for all industries. Protecht – Protecht is an extremely configurable system managing risk across all areas of any business. This system allows you to configure your own risk assessment methodology and risk based forms or registers. Each part of the system is configured to your requirements. You are then trained to configure additional elements of the system. This allows your system to grow with your company. Protecht is not only developed for high-risk industries such as mining, construction, or manufacturing, but also works extremely well for government, retail, transport, Not for Profit, APRA Regulated Entities, Property Management, Mining, Financial Institutions, Gaming & Entertainment, and Education. CodeSafe – CodeSafe is a form-based application to deliver quality, health, safety and environmental information to workers in the field. It is a simplified software program that is configured on a desktop, but deployed to workers via the iOS or Android App. It is designed to make is extremely simple for workers to have access to important company information and deliver compliance information back to head office without the need to come into the office at all. CodeSafe works extremely well as a verification of competency and training / induction system, and works offline which is great for companies that operate in remote location where internet connection is not always reliable. CodeSafe also integrates with Protecht or Beakon seamlessly and can also integrate with 3rd party applications through the use of Zapier. All our software partners are backed by ethical business practices. Although each system comes at a cost, the end goal is to ensure your system streamlines your business practices, and helps you scale up and get on with what your business does best. Contact us today to know more about how we can help you move into new technology that streamlines your business risk practices. Great article, albeit still difficult to succinctly put all aspects of safety on one page, and then try and explain how a software package will provide all your need for compliance and worker engagement. Thanks for the positive comments. I agree, it is always a challenge to communicate and spark worker engagement across the QHSE spectrums. I will be writing a new blog on this topic in the coming weeks. Hope you’re well.